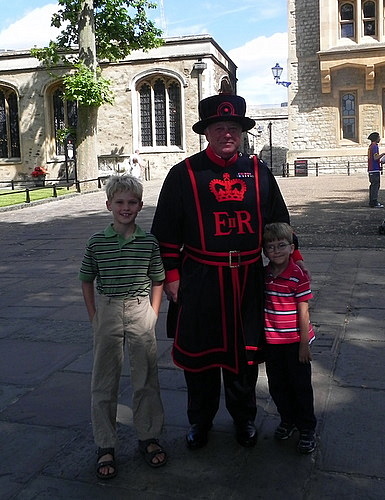 On our visit to London in the summer of 2010 I was especially excited to take the boys to the see the Tower of London. I had visited several times before, but not with children who were old enough to understand the history of this huge and fascinating place. The singular name Tower of London is actually a little misleading, as the London museum complex includes a number of towers, palaces, and other buildings, to say nothing of an enormous and thick wall from which one can admire the Thames. We arrived as the Tower was opening. I had purchased our tickets online the day before and picked them up at the Welcome Center. This proved to be the best approach – not only did I save money by booking online, I didn’t have to wait in line and the nice woman working the desk gave me some special guides (called “trails” in England) for the boys and few free pencils and stickers as well. The Tower isn’t cheap to visit, but when you consider that tickets are good for admission to all of the buildings and exhibitions in the sprawling complex as well as the tours given by the Yeoman Warders, it’s not a bad deal. We spent the better part of the day there. Travel-with-kids tip: Beat the crowds (even on a busy summer day) in two ways: Purchase your tickets in advance online and arrive right when the Tower opens at 9 a.m. (Note: opening time is 10 a.m. on Sunday and Monday). 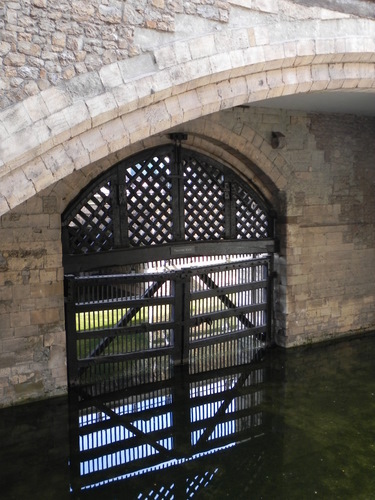 Immediately after we got our tickets, had snapped a few pictures in front of the Tower Bridge, and checked out Traitor’s Gate where prisoners were once brought into the Tower from the river, I hustled the boys over to see the Crown Jewels. I knew from experience that the lines to see these famous baubles can be quite long, but by scooting in there right after opening, we didn’t have to wait at all. I wasn’t sure if the boys would enjoy this – we’re not really enthused by princesses or bling at our house – but they were fascinated and we actually rode the conveyor belt that carries visitors past the scepters and crowns several times (another reason it was nice that no crowds were pressing from behind). After a good look at the gems, we had fun watching the soldier who guards them parade up and down. He didn’t even come close to smiling although Teddy was jumping up and down and exclaiming about how fuzzy his hat looked. 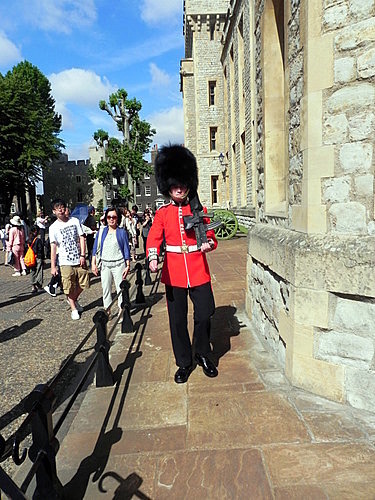 I had high hopes for the famous Yeoman Warder tour, which I enjoyed on my two previous visits to the Tower. But this proved to be the one dud of the day. Tommy and Teddy really couldn’t understand the guide’s thick accent and hated trailing around in the crowd without knowing what was going on. After about ten minutes we jumped ship and spent the rest of the day exploring the Tower independently (although the boys did want to have their picture taken with one of the guards later in the day). Our favorite part of Tower was the new Fit for a King exhibition, which is installed in the White Tower right in the center of the complex. 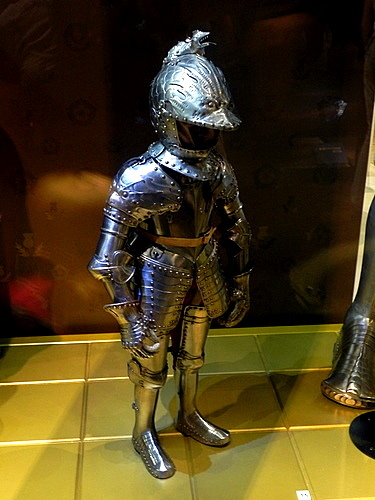 With 500 years worth of royal armor – including suits belonging to Henry VIII – this exhibition offers a fascinating look at the history of both ceremonial and battle wear. The panels were written at a level that my kids could understand and they loved seeing things like the boy’s armor designed for the son of Charles I and a huge jousting lance. They also loved the Line of Kings created by Charles II in the 17th century and recently restored after a 100-year absence from the Tower. 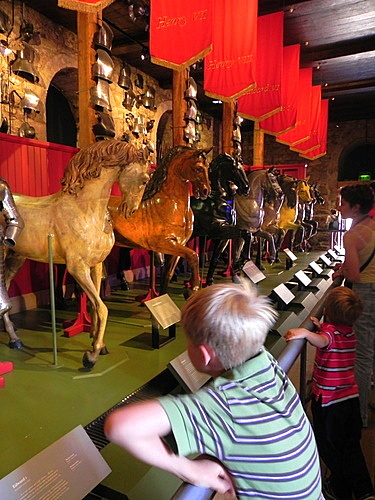 These life-sized wooden models of horses stand with attendant royal suits of armor and are meant to represent the kings of England (although Queen Elizabeth 1’s horse was damaged during The Blitz and only a head survives). 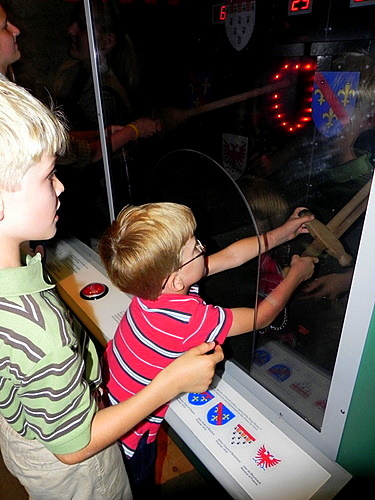 On the top floor of the White Tower at the end of the armor exhibition is an interactive display intended to show visitors what it was like to use a sword or shoot an arrow. The boys were both fierce fighters. Travel-with-kids tip: There are a few great places for lunch with kids right next to the Tower (you can leave the complex and return as often as you want during the day). I recommend Wagamama as a place for a quick sit-down meal and Eat for affordable and high-quality take away (soups, salads, sandwiches). There are lots of nice places to picnic along the river and on the Tower Green. In warmer weather there are also a variety of food trucks; we enjoyed a delicious ice cream snack later in the afternoon. After a break for a picnic lunch overlooking the Thames, we walked along the Tower wall and visited some of the other buildings in the complex including the Bloody Tower where we saw Sir Walter Raleigh’s rather posh accommodations and the Wakefield Tower, which houses a challenging exhibition of torture instruments that fascinated and repulsed Tommy. And checking out working replicas of siege weapons used in medieval times. Travel-with-kids tip: I wanted to make sure that we saw the entire Tower, but knew we might not be able to do so without stopping. So I packed a read-aloud book in my bag. When the boys got tired of walking around and needed a break from all that history, we sat on a bench in the sunshine and read together until our enthusiasm was revived. 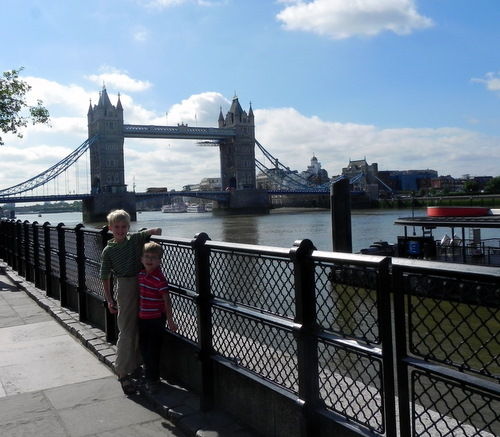 Visiting the Tower was one of our favorite activities in London and was made even more fun when we took a boat to Greenwich the next day and rode past the Tower. The boys authoritatively pointed out the various buildings and told Matt excitedly about what they had seen there. 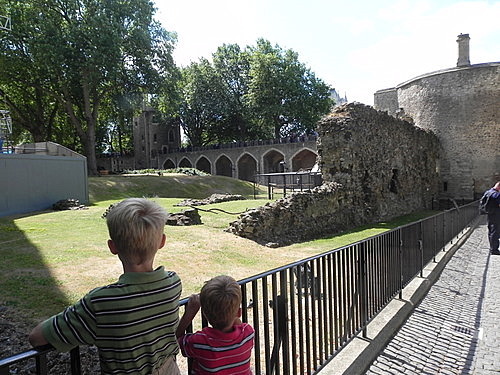 And if you’re planning to take your kids to London, don’t miss my post at A Traveler’s Library about preparing for the trip using “horrible” history books. 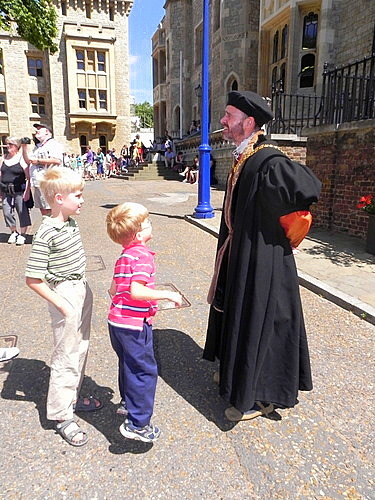 Our visit to the Tower was successful in part because both of the boys knew in advance about famous people like Anne Boleyn and the two little princes. I shared this post as part of the March, 9 2011 edition of the Carnival of Cities, hosted by Best Family Travel Advice. Stop over there to see some other great posts about cities around the world. 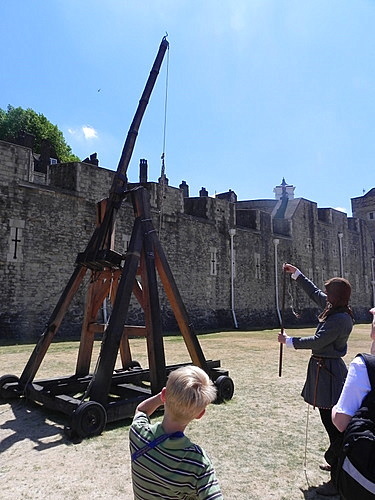 So glad you took your kids to the Tower of London — so much fascinating history there. Like you, we visited in the morning just as it opened thereby avoiding the crowds. I’d like to go back again because there is so much to see, it’s hard to really take it all in with one visit. I agree that it’s hard to see everything – there were definitely things we missed (like the Chapel of Saint Peter) because we all just got to tired and too “full”. If it were really important to get it all in, I might recommend visiting over two half days. I’m happy to hear some more of the details of your trip after reading about the Horrible terrible books for boys, your great post at A Traveler’s Library. Several people have commented on how much they liked your post. Come back any time. Thanks Vera! It was fun to go back and look at how those books influenced our trip. I’ll reiterate that our visit to the Tower in particular was made more fun because the boys knew what they were looking at. Thanks for sharing your trip to the Tower. We were there in 2009 and they were working on the installation of the new King exhibit, so we just missed it. It looks like it was lots of fun for the kids. Thanks for the great tips, Mara! I hope we make it there (and in sunny weather!) on our next trip to London. Wow, what a flashback! I loved visiting the tower as a child. Great post! 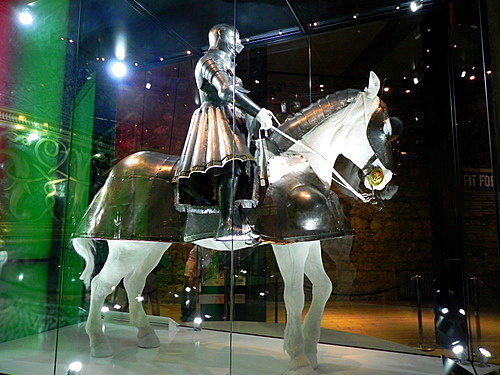 The Tower of London sounds like an amazing museum; I loved seeing your photos of the different types of armor. I’m glad you had a great trip here; your boys definitely look like they’re having fun! with some amazing things. I discussed this on my FB and my followers just adored it. 10 hours ago by motherofalltrips Terrible drive today but made up for it by eating all the (uh-mazing) pizza.